Perfect for autumn, this Cranberry-Pear Crumble is truly a treat. 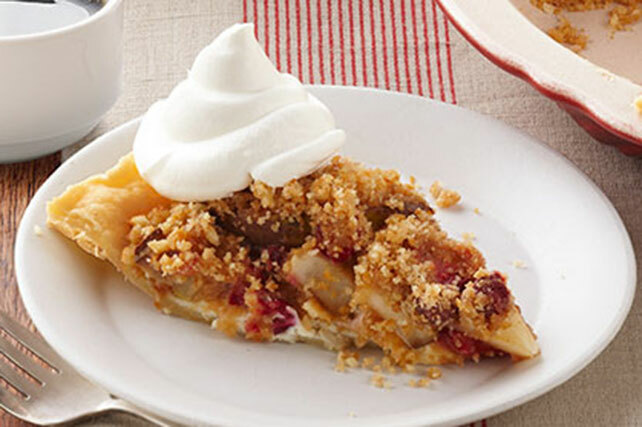 Find out why this luscious Cranberry-Pear Crumble is just one more reason to love fall. Line 9-inch pie plate with crust. Bake 5 to 6 min. or until lightly browned; cool. Meanwhile, mix wafer crumbs, sugar and butter until blended. Reduce oven temperature to 375ºF. Spread cream cheese carefully onto bottom of crust; sprinkle with half the crumb mixture. Combine fruit in large bowl. Add dry pudding mix and cinnamon; toss to coat. Spoon into crust; top with remaining crumb mixture. Bake 35 min. or until fruit is tender and crust is golden brown. Cool completely. Serve topped with COOL WHIP. Since this indulgent pie makes 10 servings, it is the perfect dessert to serve at your next party. After topping each serving with a dollop of COOL WHIP, garnish with a dash of ground ginger. Substitute 1 sliced large Granny Smith apple for the cranberries. This pie is equally delicious whether prepared with fresh or thawed frozen cranberries.